Take a glimpse into everyday life in Austria before and during the Holocaust, and see what amateur filmmakers who were there saw. The Ephemeral Films Project: National Socialism in Austria aims to preserve, analyze, and make accessible approximately 50 films related to the history of the Nazi period and the Holocaust. These ephemeral films—ones with a limited purpose that were not meant to endure, including amateur, educational, and industrial films—have until recently received little scholarly attention or systematic preservation, and yet they contain valuable cultural and historical information. 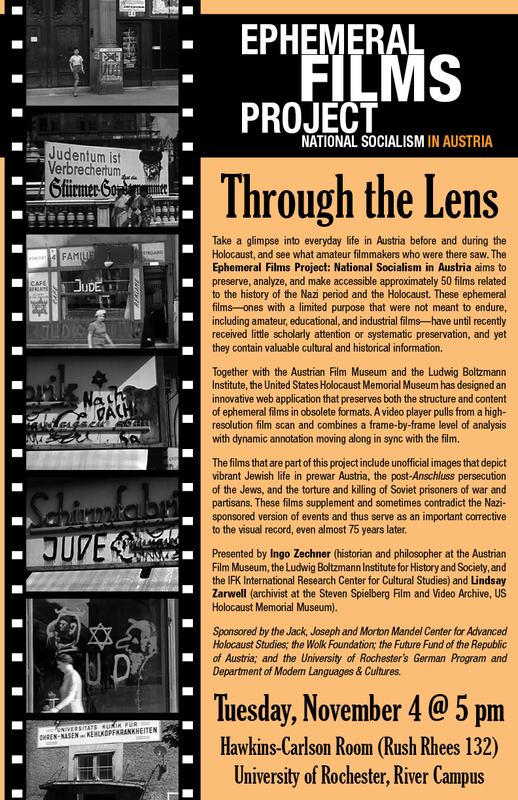 Together with the Austrian Film Museum and the Ludwig Boltzmann Institute, the United States Holocaust Memorial Museum has designed an innovative web application that preserves both the structure and content of ephemeral films in obsolete formats. A video player pulls from a high-resolution film scan and combines a frame-by-frame level of analysis with dynamic annotation moving along in sync with the film. The films that are part of this project include unofficial images that depict vibrant Jewish life in prewar Austria, the post-Anschluss persecution of the Jews, and the torture and killing of Soviet prisoners of war and partisans. These films supplement and sometimes contradict the Nazi-sponsored version of events and thus serve as an important corrective to the visual record, even almost 75 years later. Sponsored by the Jack, Joseph and Morton Mandel Center for Advanced Holocaust Studies; the Wolk Foundation; the Future Fund of the Republic of Austria; and the University of Rochester’s German Program and Department of Modern Languages & Cultures.